NELS is a Creative and Innovative eCommerce Wordpress Theme that is highly customizable, easy to use and fully responsive. This exquisite and intuitive theme is carefully developed and includes all the necessary tools and settings that will help you create a professional looking and trustworthy website. Nels allows you to create sites for a wide range of industries and business types: corporate or ecommerce sites, clothing shops, digital store, hi-tech store, watch store, men store, women store, furniture shops, bookstore, accessories store, blogs, portfolio or fashion magazines. Furthermore, Nels is fully integrated with WooCommerce Plugin, enhanced by various ecommerce shortcodes, custom widgets, elegant cards and carousels with smooth transition effects. Boost your shop experience with Premium Plugins like WPBakery (Visual Composer) and Revolution Slider to reach out the desired customers. You are free to control this theme in order to make your shop adorable for your clients! 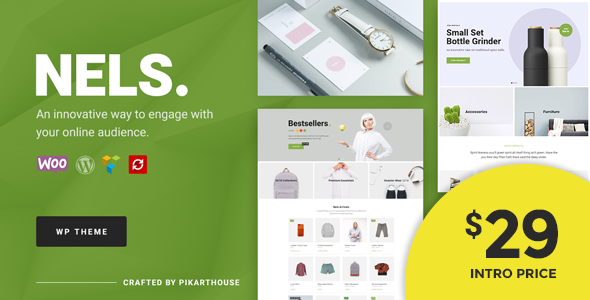 Nels Theme is built for WooCommerce, the most popular eCommerce solution for WordPress, which helps you sell anything online, shippable goods or digital files. 17 Built-in Modular Shortcodes, allowing you to digitally build any layout you think of. The images included in the demo site are for showcase only. You are not allowed to use them in other projects as they are licensed. This is why most of them have been replaced with other blank images.